Please note: This offer is only available when purchased with a full-size table. Maximum 1 pack per table. 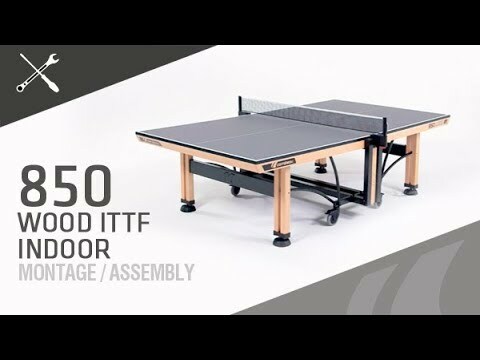 Cornilleau have certainly raised the bar with the Competition ITTF 850 Wood. Originally founded as a joinery in 1946, Cornilleau have now called upon their significant woodworking history to produce this fabulous table. The stunning 850 stands out in the market for its contemporary design, unrivalled sound and excellent play quality. Equally at home as a stylish centrepiece in a residential property or in a serious club or corporate environment. 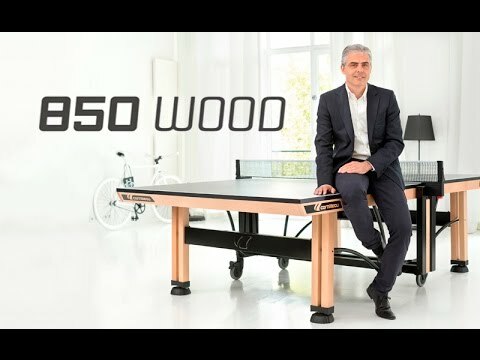 The Cornilleau 850 Wood is available with either a grey or a blue surface (both ITTF approved for competition use). Benefiting from Cornilleau’s DSI folding system, the 850 Wood can safely be opened and closed by one person in a matter of seconds. The net posts automatically fold away between the tops to protect in when in the storage position. As you would expect from Cornilleau’s flagship table, the strength is unrivaled, the wheels are first class and the play quality is exceptional. UK mainland delivery is free* and usually within 1-3 working days (charges apply for offshore and some very remote locations). We offer a pre-booked, two-man delivery service. You should receive a text the working-day before your delivery day with an estimated two-hour window. Please call 01371 875000 if you require more information. Unfortunately we are not able to assemble this table in Northern Ireland, or any offshore location. The following postcodes are not possible for assembly either: IV & KW, AB36-38 & 40+, PH19+, PA20+. We apologise for any inconvenience caused. Please be aware that the assembly is also only possible where there is sufficient, safe access to the area where you'd like the table built. For example if the table is to be assembled in a basement but the stair access is very tight or deemed to be a safety hazard by the couriers, they will not be able to take the table down there. The net & post set is an integral part of the table. Some retailers claim they are giving this as a 'free of charge' accessory!